Join Drawing Room for the launch of Adam Shield’s new publication, made as part of his Annotations commission, plus the artist in conversation with Thomas Whittle about their collaborative publishing project, Long Distance Press. Drawing Room is pleased to announce the launch of its sixth Annotations commission, Expo Dream Leech, by London-based artist Adam Shield. 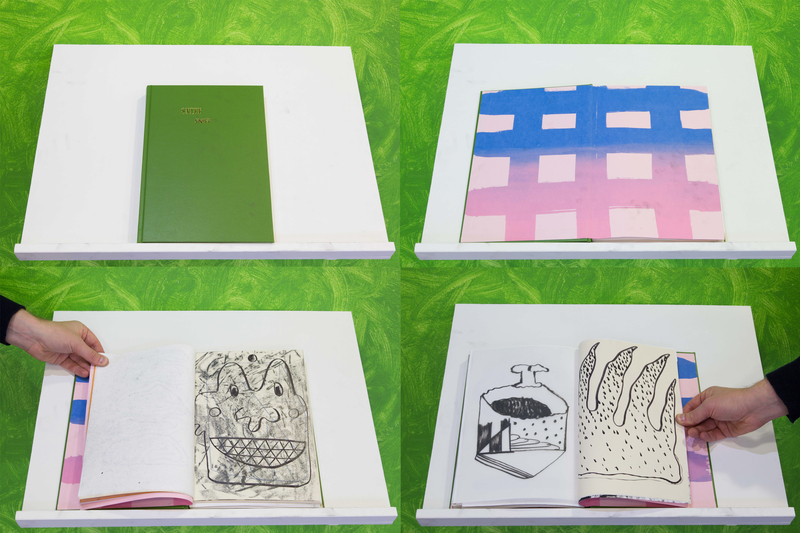 Shield’s new publication will gather together the drawings, imagery and materials collected in his studio during the creation of Expo Dream Leech. For more information about Annotations 6, click here. Long Distance Press, a publishing house, artist project, zine factory, exhibition space, commissioning body and image drum, was established in 2013 by Adam Shield and Thomas Whittle as a means to solidify their collaborative practice. With the artists working between Glasgow, Newcastle, London and Edinburgh, Long Distance Press began as a postal art project and quickly morphed into the undertaking of collaborative projects, including publications and exhibitions. Previous publications include Take Up Space (2018), SNIFF SNIFF (2017), Noodeleling (2017); and Pen Pushers (2016). Previous collaborative exhibitions include Drop Shot, MONOMATIC, Edinburgh (2017) and High Five, MONOMATIC.com (2014). Long Distance Press have most recently been in residence at The Weston Studio, Royal Academy of Art, London, where they have produced artist publications in a public gallery space, working with invited artists Sam Austen, Brian Griffiths, Katharina Hoeglinger, and Anastasia Pavlou. Adam Shield (b.1988, Newcastle Upon Tyne) lives and works in London. Graduated from the Royal Academy Schools, London (2017); and Newcastle University, Newcastle Upon Tyne (2011). Select exhibitions include IMAGE DRUM, Royal Academy Weston Studio, London; Drawing Biennial 2019, Drawing Room, London (2019); Terraforms, Kristian Day Gallery, Concept Space, London; Chumming, The Pipe Factory, Glasgow International, Glasgow; Hands Roots, Hawkins, London (2018); Drop Shot, Fetes College, Edinburgh; Bearing Liability, Strange Cargo, Folkestone; RA Schools Degree Show, Royal Academy Schools, London (2017); Premiums: Interim Projects, Sackler Galleries, Royal Academy of Art, London; Let’s Get Inside Everything, Milma, London (2016); and RIFF, Baltic 39, Newcastle Upon Tyne (2014). Thomas Whittle (b.1988, London) lives and works in Edinburgh. He works across various mediums including painting, drawing, photography as well as collaborative curatorial and publishing projects. Between 2016-2017 Whittle has featured in exhibitions in Brussels and Vienna, whilst also developing his collaborative projects Slide Night, MONO-MATIC and Long Distance Press across the UK. He also took part in the alternative school project Syllabus organised by Wysing Arts Centre. Your membership donation will be matched by Arts Council England's Catalyst: Evolve funding.